First of all, I want to wish Happy Easter to all of you who are celebrating it today. I hope you had a good time. Anyway, I am here, as usual, to deliver you a recap of all important things that happened on Stardoll. So sit back, and enjoy. On Monday, we got new '9 to 5' store collection. Another amazing collection of work related clothes and interior. On 1st floor, we have an office setting, with computer chairs, lap tops, presentation boards, etc. On the 2nd, we have a setting for news reporter, along with your own interviewer and cameraman (which is, surprisingly, available for all members). Speaking of, an interviewer can be used for all of our red carpet looks, and it is one of the 1st things I am buying once I renew my royalty membership. Also, the background of 2nd floor is just gorgeous. On Wednesday, we got new Splendid collection. The collection is rather small, but pieces are really gorgeous, with gold being the dominant color. Even though I love jewelry, I don't buy it often. There are several reasons, such as it doesn't go under our hair, you cannot have separate looks for different rooms, and an updating beauty parlor by adding a search function (just like in our closets) wouldn't hurt. 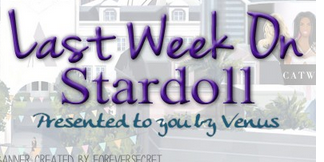 On Thursday, Stardoll announced a sale at Mawi jewelry store selected floors. Another items are leaving stores, so can we expect new collection soon? Personally, I love Mawi as it is bold, colorful and striking. But it may be hard to use and combine. But like I said, not a fan of buying jewelry, (and I am pretty much broke), so it is a no from me. And on Friday, we got new Pet-a-Porter collection. That was it... No, wait. We forgot to report we got an adorable offer for any purchase - a cute dog our dolls can 'wear', valid until.. well, today. Anyway, a nice week, looking forward to next one. As usual, vote, comment, and see you soon.